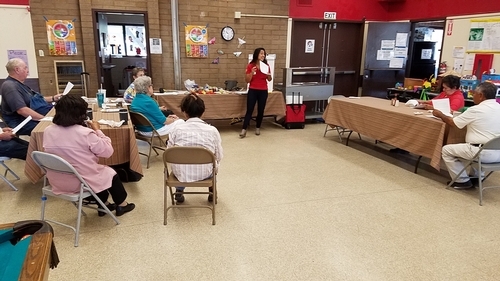 Students at Balderas and Winchell Elementary Schools receive no-cost nutrition education and food tastings throughout the school year if their teachers are enrolled in the UC CalFresh Nutrition Education Program. The aim is to instill healthy eating behaviors and physical activity habits at an early age! The beauty of learning is that it is an ongoing feat for all people of all ages! 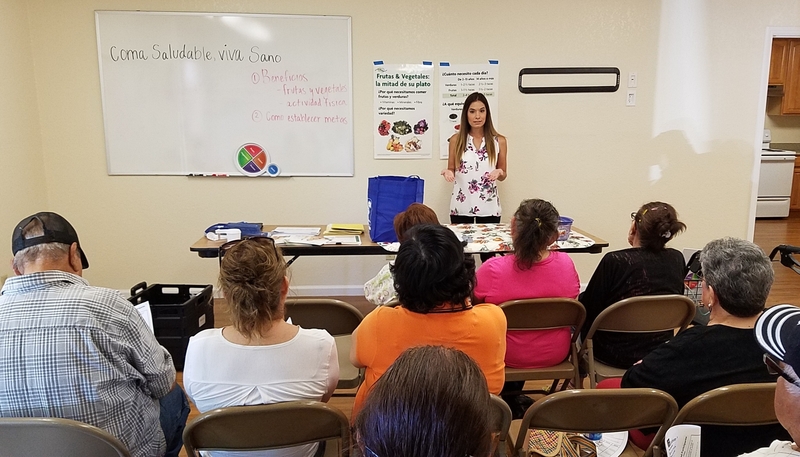 Parents at Balderas and Winchell Elementary Schools joined in on the nutrition education fun as they explored how to make healthy eating the right and easy choice. 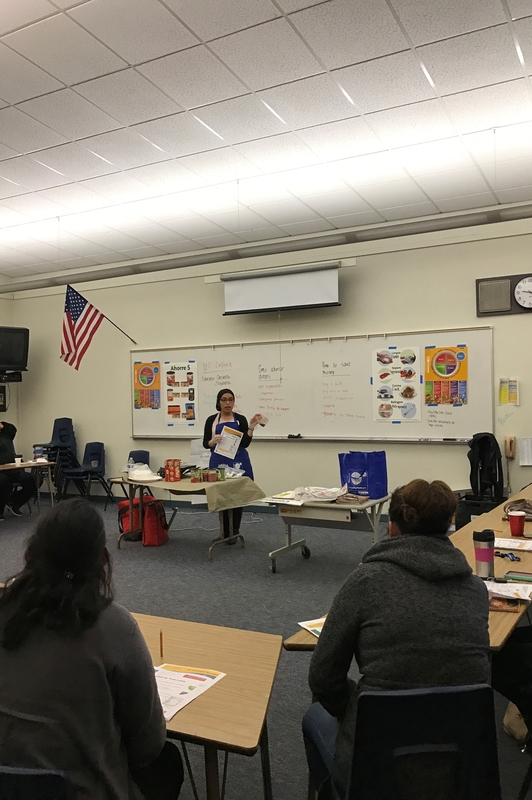 Parents were eager to learn about how they could plan, purchase, and prepare healthy food choices on a budget, and they agreed that eating healthy can sometimes be straining on the budget, but small changes can make a world of a difference! Small steps are the key to success. Make a grocery list and stick to it! Shop when you are not hungry. Plan your meals around sale food items and use coupons! Compare unit prices and try store brands! Visit your local Farmers Market for seasonal fruit and vegetable options. To find a Farmers Market near you, visit the Ecology Center. Look for Market Match. Learn all about Market Match on our blog so that you can extend your fruit and vegetable dollars even more! Do you have a thrifty tip or something that helps you buy healthier food, while on a budget? Comment below and share with us. We love hearing from you! Preparing a healthy recipe is always the most anticipated class activity. Learning how to read a recipe and prepare healthy meals is a lifelong skill that can be used immediately to improve the eating behaviors of our participants. Our program participants are also encouraged to keep an active lifestyle, and move more! Does this mean parents got a little taste of physical activity in every class? You bet they did! Upon the successful completion of a four-week nutrition education series, parents received a University of California certificate that acknowledged their commitment to adopt healthier lifestyles. Additionally, they received a bag containing reinforcement items, such as cookbooks, measuring cups and spoons, scrub brush, grocery list, and much more! Give it up for Balderas' Plan, Shop, $ave, and Cook class of 2017! Give it up for Winchell's Plan, Shop, $ave, and Cook class of 2017! 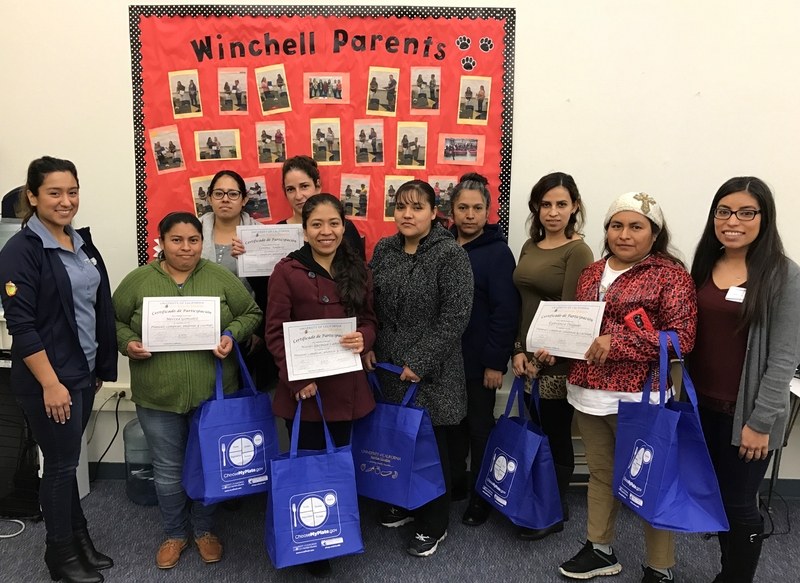 Thank you to both Balderas and Winchell Elementary Schools for opening their doors and allowing us to help improve eating behaviors for families in Fresno County! Would you would like to invite us to host a no-cost parent nutrition class at your school site? Contact Javier Miramontes, UC CalFresh Program Supervisor, to get started! 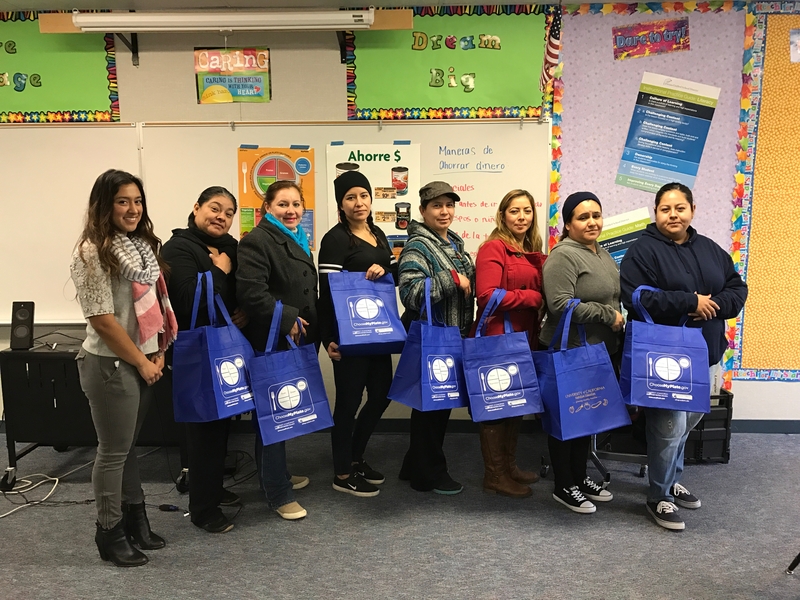 On November 14th, 2016 UC CalFresh was invited to the Parent Coffee Hour at Rowell Elementary in Fresno. 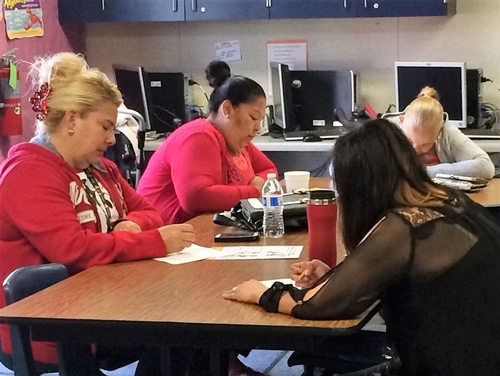 The parent coffee hour is a designated time when parents can meet with the school principal to ask questions, address concerns or participate in a presentation. 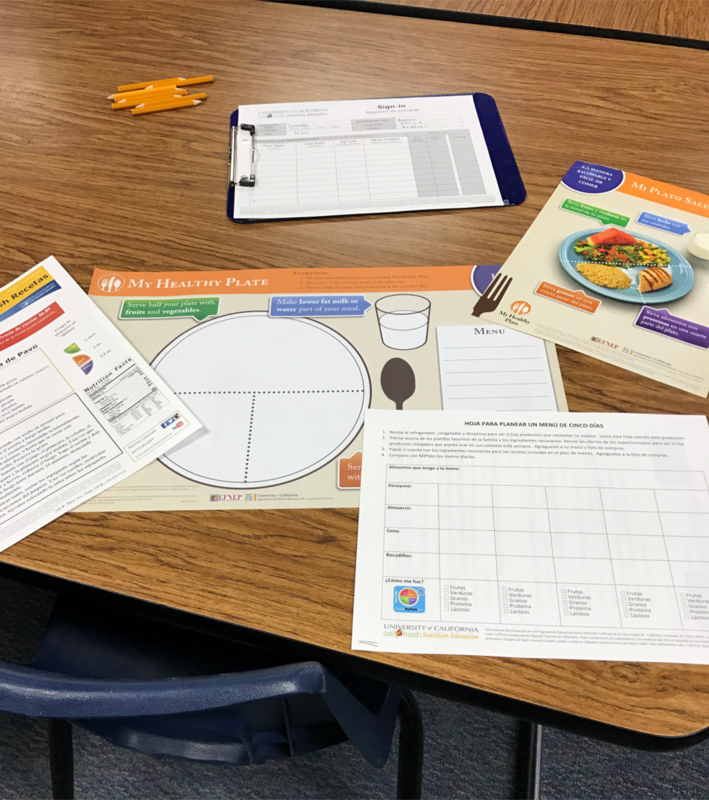 Nutrition Program Coordinators, Araceli Delgadillo and Emily Harris, presented the “MyPlate Workshop.” There were 15 parents in attendance along with Rowell's principal, Alice McClintock. The parents learned about MyPlate and received tips to help them follow MyPlate guidelines. The parents also sampled Broccoli Cheddar Soup, and it was a hit! A nutrition series will be offered to the Rowell Elementary parents in the spring of 2017. In a saucepan, prepare broccoli according to directions. Drain water. Add carrots, cream of mushroom soup, and one can of milk to the broccoli. Stir over low heat until vegetables are cooked and the mixture is steaming hot. Add cheese, stirring until melted. 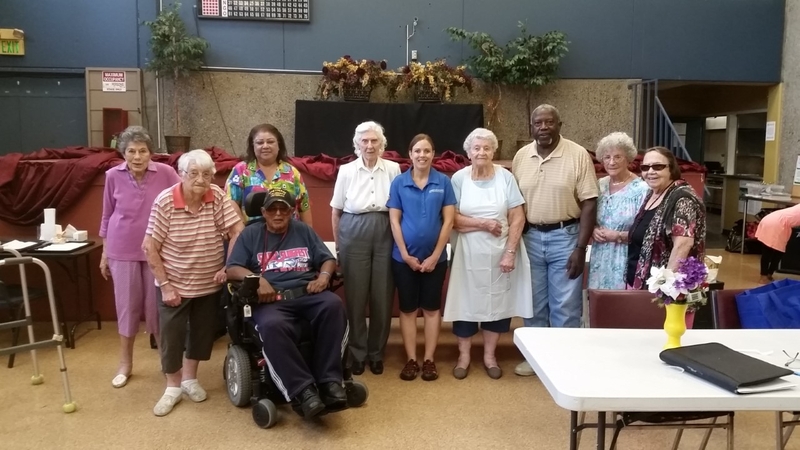 The Housing Authority of Madera County collaborated for the 3rd year with UCCE for summer nutrition classes. This year UC CalFresh was able to hold multiple classes at two different sites to reach all audiences: seniors, adults and youth. "You can never get enough education," was something Nutrition Coordinator, Angelica Perez, learned from teaching seniors. 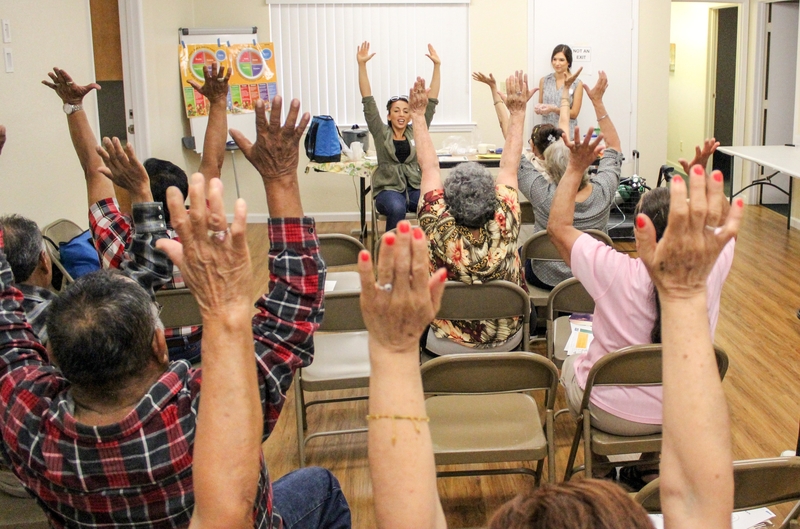 Using the Eat Smart, Live Strong curriculum, the senior participants learned the benefits of getting at least 30 minutes of physical activity daily and consuming three and a half cups of fruits and vegetables every day. The group really appreciated the break out sessions where they shared recipes and ideas of how to incorporate more physical activity into their lives. The participants were very thankful to have UC CalFresh come and hold classes about nutrition, and many shared that the class helped them to create healthier habits throughout the weeks the lessons were held. 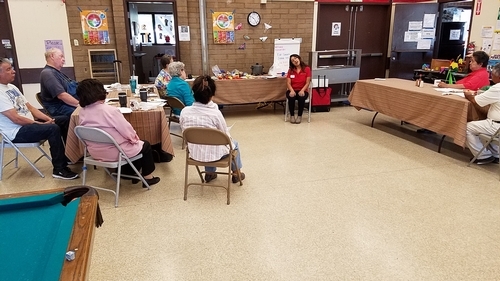 Angelica Perez teaching the Eat Smart, Live Strong Curriculum to participants in Madera County. Maira Enriquez leading the physical activity portion of the class. 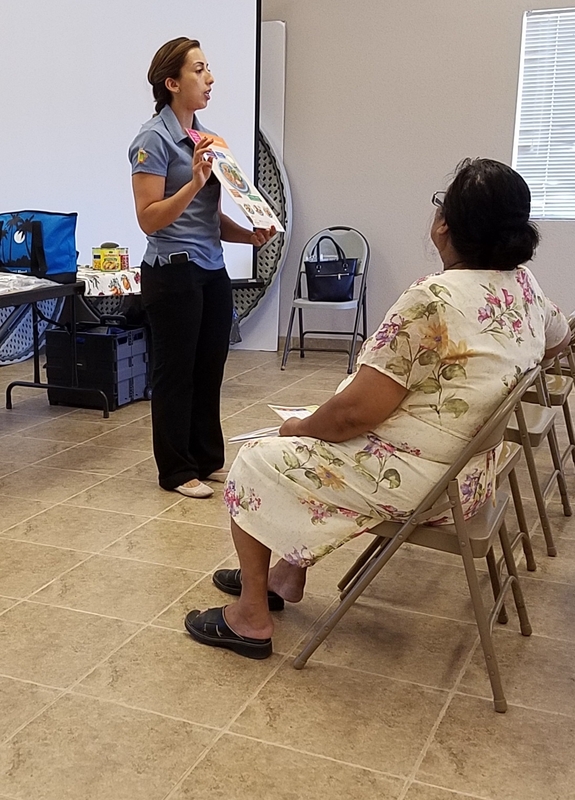 Another nutrition education series was held at the Madera Plaza Apartments. 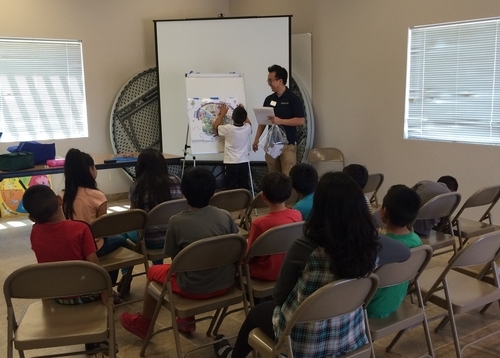 In this series, UC CalFresh reached families with the Plan, Shop, Save and Cook for the parents and the My Amazing Body youth curriculum for the kids. In the Plan, Shop, Save and Cook Series, one participant shared how she saved money on her monthly grocery bill by implementing the tips from the class. Maira Enriquez teaching Plan, Shop, Save and Cook to the Madera Plaza participants. Angelica Perez and Tacu Vang demonstrate the recipe for the Plan, Shop, Save and Cook Curriculum. 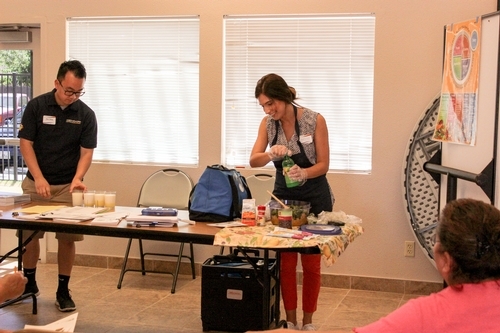 The youth class was also very successful, and the children at the Madera Plaza Apartments really enjoyed the nutrition activities and tastings of different foods from the five food groups. Tacu Vang teaching the youth class about germs and how to properly wash their hands. Summer always ends with good memories! The classes allowed for new participants to be reached with information regarding nutrition, physical activity and food safety. UC CalFresh looks forward to future collaborations with the Housing Authority of Madera County and the families of Madera County. Parents at Jefferson Elementary School were thrilled to begin the Plan, Shop, Save and Cook Series. They were excited to learn about ways the class could help them save money when it comes to healthy cooking at home and also learn ways to plan healthy meals. Many activities were included during the lessons, which allowed them to apply the skills they learned. One activity had the parents first create a meal plan and then plan their shopping lists. This activity allowed them to see the food groups they were eating plenty of, and which other food groups were being left out. Jefferson parents planning their families' meals for the week and creating their shopping lists. 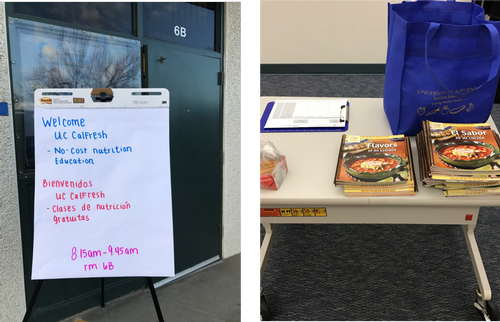 As the lessons continued throughout the weeks, many of the parents were eager to share their success in balancing all of the food groups on MyPlate to ensure balanced diets. Others shared their new found awareness of store flyer sale items, which included seasonal fruits and vegetables. Many parents also learned how low their whole grain consumption was, and began incorporating more whole grains into their meals. A couple of the parents even shared that they made our enchilada casserole at home and their families loved it, not knowing that they were eating whole grain brown rice! 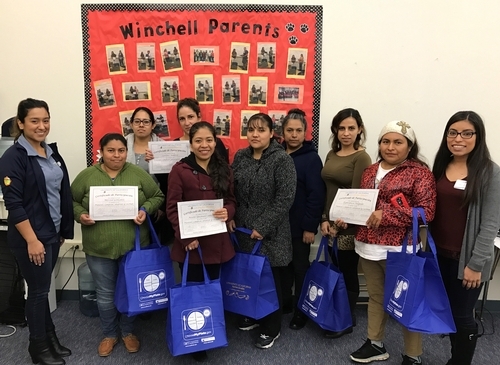 Nutrition Educators, Araceli and Angelica, with some of the parents from the class who received their certificate of graduation from the Plan, Shop, Save and Cook Series. Overall the class was very successful and we had 7 parents graduate the Plan, Shop, Save and Cook Series. Many parents appreciated learning nutrition information provided during the class by mentioning how useful it was for them to ensure that they make everyday, healthy eating a positive and simple, one step at a time, change. They know that these changes will make an extreme difference in their overall health and the health of their families. 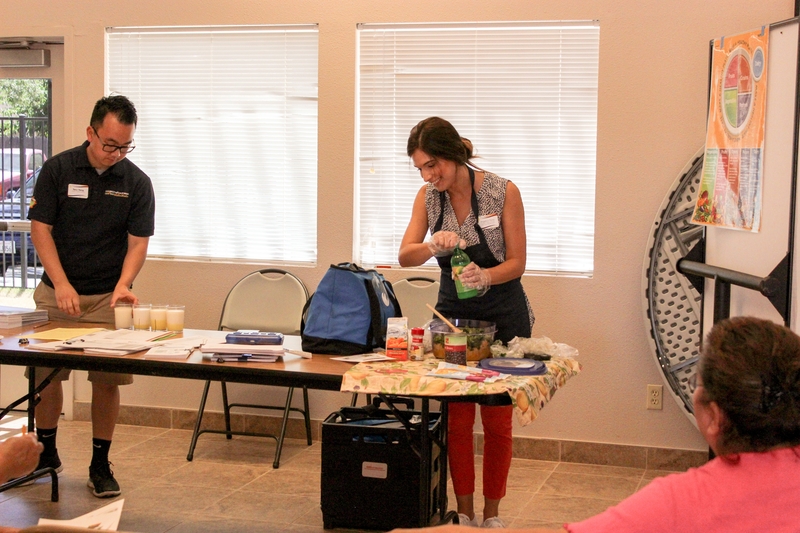 Interested in bringing an adult nutrition education class to a school or community center near you? Contact our Adult Nutrition Program Supervisor, Javier Miramontes, at 241-7531 or jfmiramontes@ucanr.edu for more information.